A basic understanding of Swift and Node.js are needed to follow this tutorial. 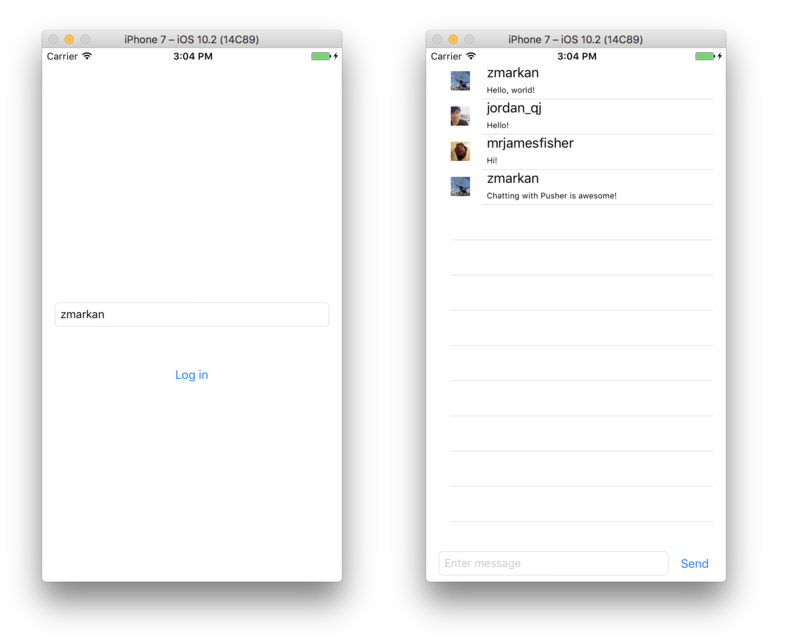 We thought we'd create a walkthrough of how to easily build an iOS chat app with Pusher. 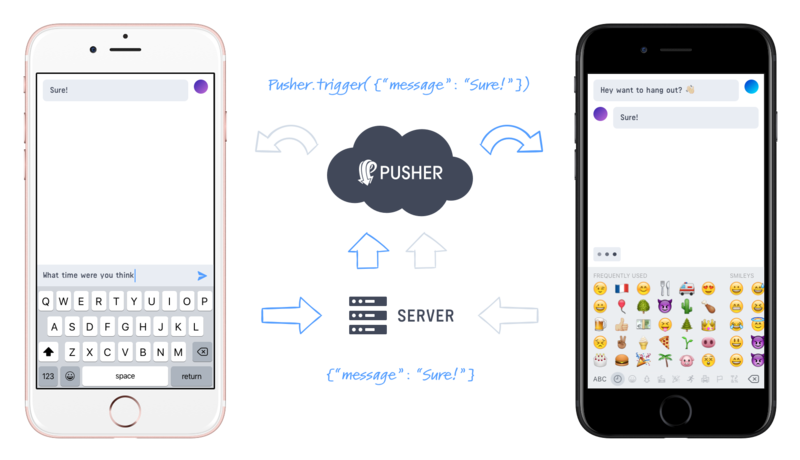 Together we will build a group chat application, leading you through how to use Pusher to send and show realtime messages in your UI. The app we're building is a simple chat application that uses Pusher to send and receive messages. It has two screens - the "Login" screen where we enter our Twitter username, and the "Chat" screen where we do the messaging. 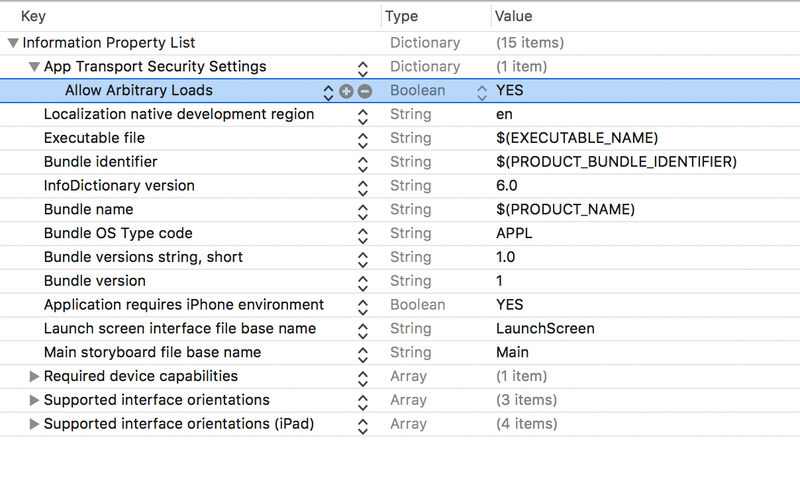 If you haven't yet, create a new application on XCode. By default the wizard offers you to create a Single View Application for iOS, and that's perfectly fine. Once you've done that, you'll need to prepare the dependencies for the app. The dependencies you need are Pusher Swift for interaction with Pusher, and AlamofireImage for performing network requests, and loading images over the network. The easiest way install dependencies is by using CocoaPods. If you don't have CocoaPods installed you can install them via RubyGems. And then run pod install to download and install both dependencies. CocoaPods will ask you to close XCode if it's currently running, and open the newly generated .xcworkspace file. Do this now, and XCode will open with your project configured. For our login feature we'll just create a simple page with a field to enter a twitter handle and a login button. First rename our scene to "Login Scene", and then drag the two elements onto it. Also rename the ViewController to LoginViewController. Control-drag the each element into the LoginViewController class to create the IBOutlet (for the TextView) and the IBAction for the button. Name the IBOutlet twitterHandle and IBAction loginButtonClicked. This will grab the current text in the twitterHandle field and set it to the ChatViewController, and transition to the Chat screen. But the ChatViewController doesn't exist yet! Create a new ViewController in the Storyboard and the corresponding ChatViewController.swift class. Add to it a TableView, a Text Field, and a Button as in the example. We will listen to new messages in realtime by subscribing to the chatroom channel and listening to events tagged new_message. Pusher channels can support unlimited number of message types, but in our case we are only interested the single one. Then subscribe to the chatroom channel, and bind to the new_message events, printing their messages to the console. Lastly, connect to Pusher. Now, let's show the messages as they arrive in the UITableView. 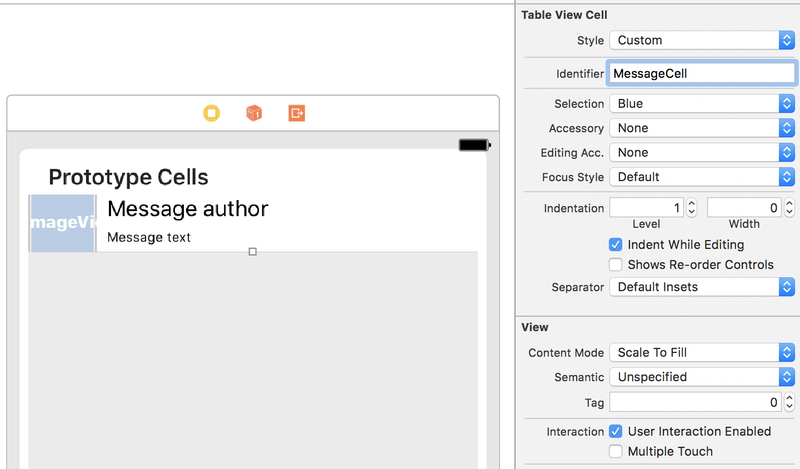 We will create a Prototype cell in the UITableView in the Storyboard, and specify a class for it. Now create a Message.swift which will hold a struct representing a single Message object. It just needs to hold two strings, for the author and message. First we set up the text in the author and message labels, and lastly we use the AlamofireImage library to load the image from Twitter avatar into the authorImage field. So far, we've created a client that receives items. But what about sending them? We'll do that next. First, we'll need a server-side component that receives messages and sends them back to Pusher. We prepared a simple NodeJS application that will serve that purpose. You can find it here. First clone the repository and CD into its directory. Then run npm install to setup dependencies. Then open app.js and change the Pusher initialisation fields there to include your App ID, key and secret. You can copy these from your Pusher Dashboard - the Getting Started tab will have everything you need. Once you've done that you can launch the app by running node app.js. If everything works as it should, you should see the new message appear in your app. The last thing to do is to create the function that triggers and sends the message to us. If you are running the Node server locally XCode might not allow you to make the request. You can get around this by adding App Transport Security Settings to your Info.plist file and set Allow Artibrary Loads to YES. 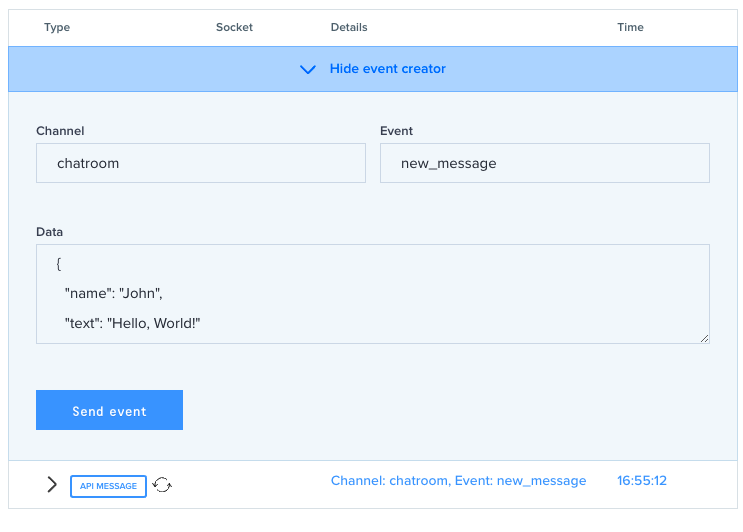 Use Pusher client events to send messages from one client to another. You could use our webhooks to notify your server when messages are sent, allowing you to persist them in your database. Use Pusher presence channels to create live user lists and show who’s online in realtime. Use our REST API to determine whether a user is connected to Pusher. If they are, go ahead and send them a message as normal. If not, send them a native push notification leading them back to your app. Even with such a basic app, hopefully I have shown you how easy and few lines of code it is to drop in Pusher to any iPhone app. Feel more than free to let us know what you end up building with Pusher and iPhone!